Fires are a wonderful heating source that provides you with the added perk of creating a nice, relaxing ambiance that you just can’t get with a furnace. Unfortunately, there are two potential risks with fireplaces: burns and fires. In order to mitigate some of that risk you can invest in an electric fireplace and you’ll still get to keep the overall feel and heat source. But we still feel obligated to remind you that any heat source has some risk. The Consumer Product Safety Commission (CPSC) estimates that in a recent year there were more than 10,000 residential fires and nearly 200 deaths associated with portable or fixed space heaters. They also estimate that an average of nearly 100 people die each year from carbon monoxide poisoning caused by heating systems (such as electric fireplaces), ovens and water heaters. So making a smart choice on your electric fireplace isn’t just about saving money; it’s about saving lives, too. With that kind of pressure, you may feel overwhelmed, but don’t; we’ve done the research for you and have compiled a list to get you started on your purchase. We reviewed dozens of electric fireplaces to identify the best of the best. We looked at fireplaces with programmable timers to shut off, even if you fall asleep in the warmth and those you’ll hang on your wall. We found inserts into existing fireplaces to create a safer or more efficient heat and those you just plug in and push up against the wall. We also cover the best space heaters in a separate review so you can find what you need to keep every room in your home warm and toasty. 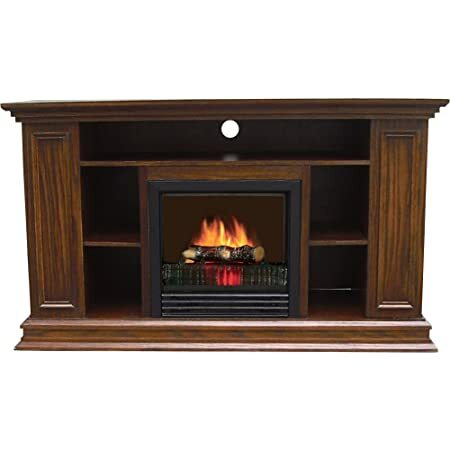 If you’re in the market for an electric fireplace, look no further than the PuraFlame Western 33″ Black Electric Firebox Fireplace Heater Insert With Remote Control. Throughout our research, one product stood out as the clear winner: the PuraFlame Western 33″ Black Electric Firebox Fireplace Heater Insert With Remote Control. It comes in a variety of sizes that will allow you to fit in into any standard fireplace and all the control and heating ventilation is located on the front, so you can even cut an appropriate sized space in your wall, as well. And all that power will be at your fingertips while you’re sitting across the room with the remote firmly in hand. 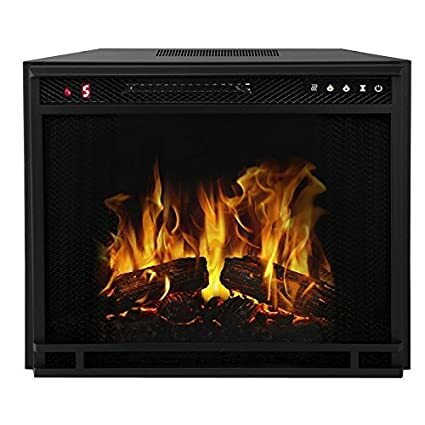 The PuraFlame Western 33″ Black Electric Firebox Fireplace Heater Insert With Remote Control is a perfect solution for any number of possible concerns or DIY opportunities. We love that, even though this is strictly speaking, a fireplace intended to sit inside an existing (but not used) fireplace, that isn’t the only option you have with it. You can easily build your own fireplace hearth for this, and in fact, the customer reviews on Amazon are full of pictures of people doing just that. There is even a few photographs detailing a step-by-step on how to simply cut a hole in the wall and secure this inside it. This electric fireplace insert can easily be installed however you choose and features an energy-saving LED design that makes it both beautiful and economical. The fireplace can be operated with or without heat so you can enjoy the look of a fire year-round, so even if you don’t want the warmth, you can still enjoy any stress-release you get from sitting by the fire with a nice cup of hot coco or mulled wine. With over 400 customer reviews on Amazon, this electric fireplace has well-earned its impressive overall rating of 4.5 stars. And it’s not hard to see why; with a remote that allows you control of so many of its features, you don’t even need to get up to get the exact setting you want. 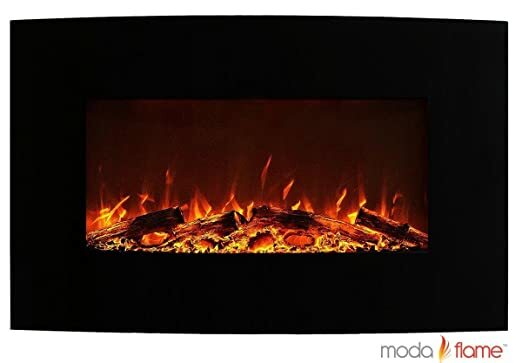 For a classic-looking fireplace that requires none of the work building or maintaining, check out the Moda Flame Houston 50″ Electric Wall Mounted Fireplace. 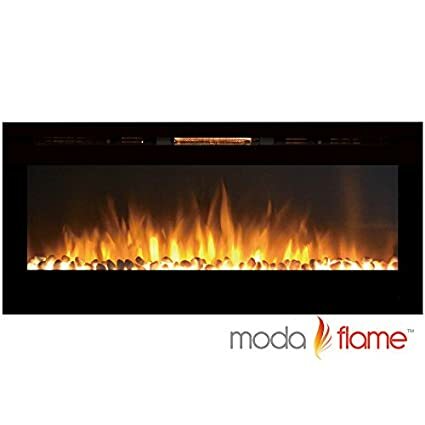 The Moda Flame Houston 50″ Electric Wall Mounted Fireplace allows you to choose one of three settings including one that is flame only without heat, so you can enjoy the look of a fire even during the hot summer months. It is a vent-less system and requires no special installation specifications, aside from 36 inches of clearance which may only come into play if you opt to mount it under a television. You’ll be able to use this fireplace anywhere you have a plug; it works off a 110V plug, and won’t blow your fuse every time you operate it. And installing it is a piece of cake – all the mounting hardware is already included so you won’t need to make any extra trips to the hardware store. With well over 250 customer reviews and an overall rating of 4.2 stars, it’s reasonable to expect you can be another satisfied customer should you buy this. After all, 89% of the reviews are positive, so there’s a good chance you’ll be in that overwhelming majority. Enjoy the luxury of an electric fireplace, without the need to empty your bank account to have it. 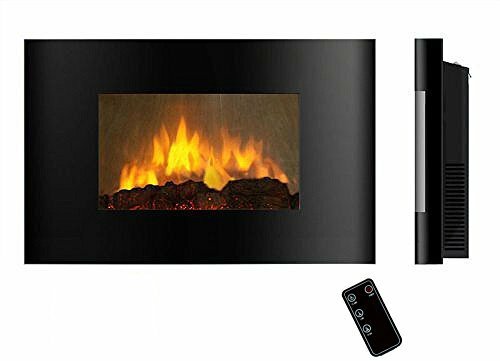 The Clevr 32″ Vertical Wall Mounted Modern Black Electric Heat Fireplace Heater with Remote features two heat settings and is ideal for heating rooms up to 400 sq ft in size. Thanks to a unique design, it can be recessed mounted for a sleek and low-profile look or simply placed on a mantle for a low-effort installation that won’t leave the appearance any worse off. You can even hang it on the wall like you would a canvas picture and we especially love the warm glow into the room that the side lights offer. The remote controls the two heat settings and the flame on or off, as well as the six back light colors. The fireplace includes decorative crystals to give a more realistic appearance and the flame can be turned on without the heat, so you’ll be able to enjoy that glow all year long. 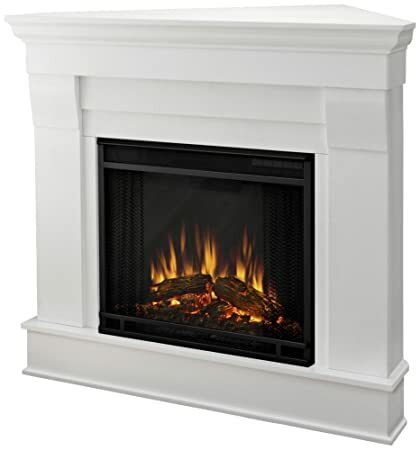 The heat is ventilated from the top of the fireplace and requires a 3.28 feet clearance for safety; more than reasonable for the most common placements. 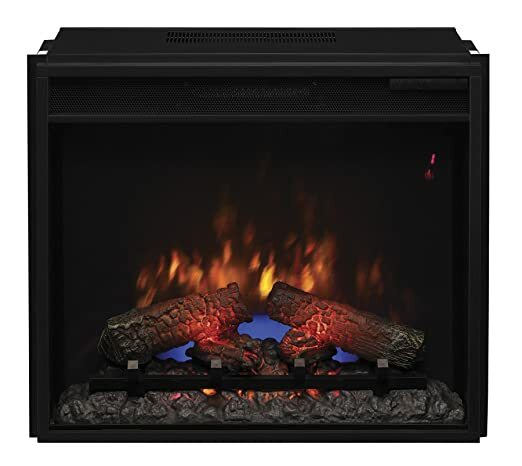 This electric fireplace has an overall rating of 4.3 stars and while that is certainly more than respectable, the number we like to focus on with this one is the price: It’s only $150! And for the glowing reviews (pun intended with this glowing fireplace), it’s definitely a steal. 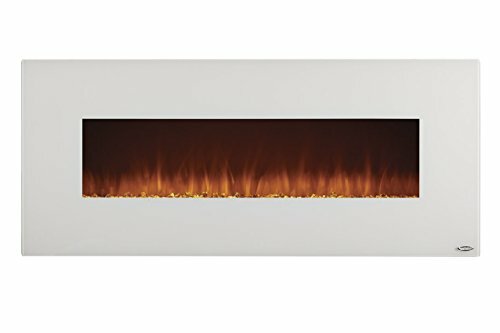 Mount the Touchstone Ivory 50″ Electric Wall Mounted Fireplace to your wall (or in it) and enjoy a heater that will add an element of sophistication to any room. 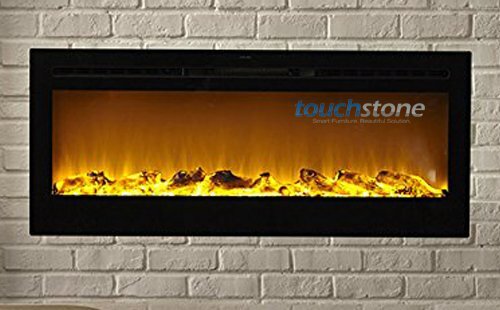 The Touchstone Ivory 50″ Electric Wall Mounted Fireplace is available in a choice of four color options to suit nearly any home’s decor. You’ll also get to choose whether to use the faux wood or the crystals, and you can alternate as your mood changes because both are included; no need for any extra purchase. It can be recessed-mounted for a sleek, low-profile design or just hung directly on the wall just like any other piece of decor. But this isn’t just any other piece of decor, despite its gorgeous appearance. It’s also suitable for heating rooms up to 400 sq ft in size and can be controlled by just a touch of a button; even from your bed. You can control the LED lit fireplace or the two heat settings (high and low) and you won’t even need to worry about venting it yourself; just make sure the heat vent at the top has an appropriate clearance and you’re set. 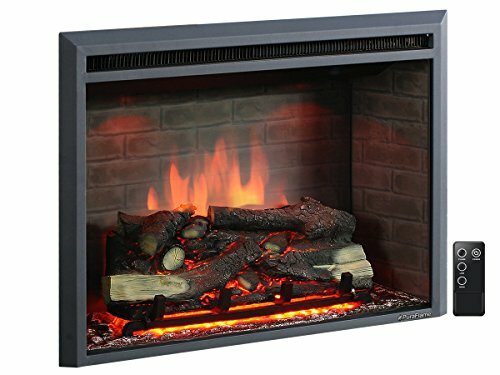 This electric fireplace has an overall rating of 4.4 stars on Amazon, which has been given by over 100 customer reviews. And while that’s not the largest number of reviews just yet, the percentage of positive ones is certainly more than enough to support the idea that you’ll love this! 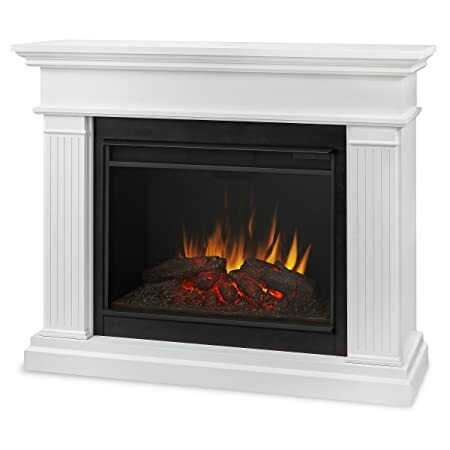 If you’re looking for an electric fireplace to help heat your home by placing in your existing fireplace, you won’t want to overlook the ClassicFlame Infrared SpectraFire Plus Insert with Safer Plug. 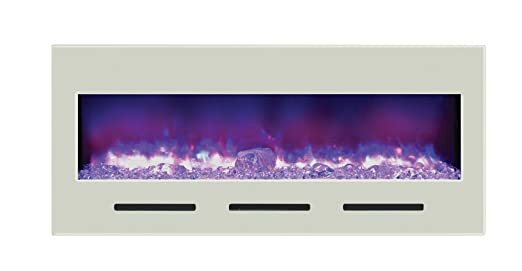 The ClassicFlame 28II300GRA Infrared SpectraFire Plus Insert with Safer Plug uses infrared technology to provide supplemental heat for spaces up to 1000 sq ft in size and the adjustable flame effects that can be operated with or without heat for year-round enjoyment. The flame effects are LED, so you may not be able to see it especially well in a room that gets a lot of sun during the day, but such is the nature of the highly efficient LED lighting. 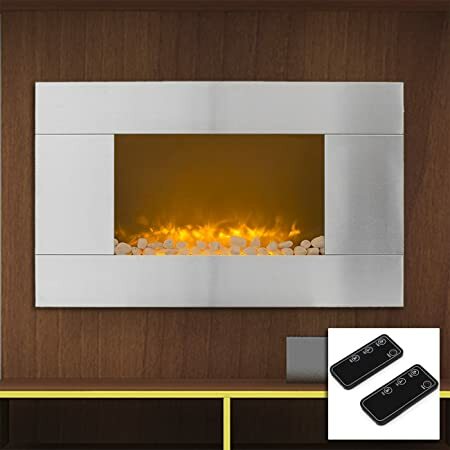 The remote can control all of the fireplace’s features, including the flame colors (five separate colors or an automatic cycle through), an infrared heat, countdown timer (from 30 minute to 9 hours), 5 levels of flame brightness, temperature setting, ambient light and the on/off. That’s a lot of control at your fingertips without even getting off the couch! The unit goes back approximately 6″ and give a legitimately 3-D feel with realistic flames and faux wood. There are right around 100 customer reviews for this exact model on Amazon giving it an overall rating of 4.5 stars, but several similar models by the same manufacturer that are reviewed just as well, too. With this in mind, we’re confident this is a fireplace that will keep you satisfied in your home. If you have a certain area in your home that just isn’t being heated to your liking an electric fireplace may be the answer for you. It’s range may not be as large as a wood-burning stove and you can’t usually heat your entire house with one, but if your furnace struggles with getting your newly finished basement or attic warm, then finding an electric fireplace that will warm the room may do wonders. Likewise, if you can keep your furnace, which may be quite expensive to run, on a minimal temperature setting to save a few dollars, you may be able to supplement that with an electric fireplace turned on only when you need it, in only the rooms you’re in at the time. Plus, we all struggle with the first time turning the heat on in the fall; an electric fireplace can help put that off a bit longer. The heat isn’t the only reason you may want an electric fireplace, though. Even if you only have a furnace in your home, you don’t have to do without the fireplace aesthetic. That calm that washes over you when you’re done for the night and you just want to relax with your feet up in front of a fire can still be yours even if you don’t have the chimney or wood burning stove. The addition of an electric fireplace is one that has the potential to improve your decor scheme and ease a bit of your stress level. Area of effect. You’ll want to check out how large of an area your electric fireplace will be able to heat effectively. Putting one in a room too big for it to be able to heat won’t do you very much good if you’re depending solely on that as your heat source. 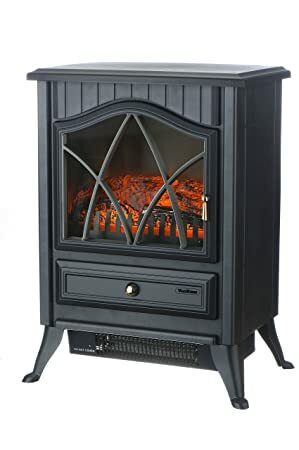 However, you will be able to take a bit of the bite off in a chilly room, even if you don’t have a fireplace powerful enough to heat the room on it’s own. And if you have an alternative (and primary) heating source, you may not mind. For example, placing it in the living room of an open floor plan home won’t make the whole floor warm, but it will warm your feet while you relax next to it, waiting for your furnace to kick on. It’s important in this case, though, to not set it to a temperature, as it will likely never be able to reach that temperature. Just keep it on high until your toes thaw a bit and turn it off before bed. Realism. Studies have shown that sitting by a fire is a relaxing past time. It could be an evolutionary response to something that deterred animal attacks or just the calm that being warm provides. No matter the reason, though, you may be able to decompress and enjoy a simpler life, if only for a moment, with the addition of a fireplace in your home. For that reason, you’ll want to make sure your electric fireplace is realistic. It may not give off any of the smoke, crackles or smell, but if you get a fireplace with authentic looking wood or rocks that will glow with an appealing light, then you may find yourself in a calmer state. Wall mount. This is likely the easiest way to introduce an electric fireplace into your home. You can simply use some wall mounting brackets and drywall screws to hang it directly onto your wall. Most of the time, all these pieces are already included. The fireplace will likely hang a good 3-4″ out, so keep that in mind for small areas, but what an easy install! If you’re just dying to turn it into a DIY project, though, you absolutely can by creating your own pallet or stone background to give it a more authentic feel. But you may just be surprised how easily you can change a room by simply hanging this one thing on the wall. Insert. Some inserts will depend on the brick surroundings for the heat it provides, but for the most part, you can just stick an insert inside a wall. However, if you have a fireplace that is doing nothing for you, if it has a cracked or damaged flute, for example you may want to use the space for an insert. You’ll be able to use the space for effectively warming the room without the costly task of fixing and repairing a chimney. With an electric fireplace, you’ll be able to “build” a fire exactly where the room was designed to have one, without any work in upkeep. So even if your fireplace is fully functional, sticking an electric insert is a fast and easy way to keep the room’s balance without the work and upkeep a standard fireplace requires. Multi-purpose. If you get an electric fireplace that’s built into an entertainment center or some sort of shelving unit, then it can become a part of the focal point of your entire room and you’ll likely end up using the fireplace more often. Frequently we find ourselves buying these new purchases that we don’t use them as often as we thought we would. In fact, you may only use it when you’re cold. If it’s something you’re always looking at though, then there’s a good chance you’ll use it more often. Because a fireplace’s ambiance can create a peaceful and relaxing environment, you may actually benefit from using it all the time, just without the heat on it. Remotes. One of the best features of an electric fireplace is how easy it is to turn on. You won’t need to build or maintain a fire, the entire power of heat and of ambiance is right at the push of a button. It’s a natural evolution that the button become wireless; a fact you will be eternally grateful for when you need turn the heater off at 3 o’clock in the morning because you fell asleep with it on high. Remotes have all kinds of features for all different types of fireplaces; you can set up a program and schedule on some or you can just control the setting as you like it. The key, though, is that you don’t even need to get up to deal with an electric fireplace. 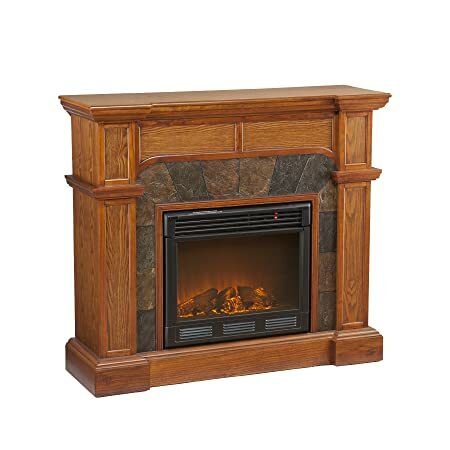 An electric fireplace is a faux fireplace that will give the appearance of a traditional fireplace; wood or coal or even a gas fire pit with crystals along the bottom. The beauty of the electric fireplace, however, is that it is actually very different, despite appearances. Not only will you not need to pay for a fuel source to burn, you won’t need to work at all to start or maintain the flame. Because the flame isn’t real. Which means you won’t need to worry about any of the risks of fire, either. An electric fireplace will operate as a space heater, passing electricity through conductive wires and ventilate the radiant heat out of it and into the room. You can also operate most electric fireplaces without the heating element; so you can just often just enjoy the fire, even on hot summer nights, without roasting. Do electric fireplaces cost a lot to run? The cost of operation of your electric fireplace will, of course, depend on the efficiency of your unit. If you’re using it for ambiance without the heating element, you can expect to pay about the same as any other light; if it’s LED, less than if it’s an incandescent or a CFL. (Most will be LED, though.) You can expect to spend about $1.50 annually for the ambiance. For the heater, though, that’s a different story altogether. Depending on the type you get, and how warm you keep your room, you can expect to spend anywhere from 8 to 23 cents per hour of use on any kind of electric heater, and an electric fireplace is no different. Due to the design of an electric fireplace being designed to mimic a fireplace and not to be the most efficient shape imaginable for a heater, you can expect the cost to be slightly skewed to the more expensive side, but not for all electric fireplaces, and not by loads. The entire point of a heating electric fireplace is to heat a room, but it goes without saying that the efficiency of how well it heats the room depends on the quality of your fireplace. Some are better than others and you may notice a dramatic difference if you’re transitioning from a standard fireplace to an electric fireplace. That may mean you simply need to adjust how you operate the electric fireplace; they aren’t the same and you may find yourself getting overheated or cool if you handle it the same as you would a standard fireplace. All things considered, though, a high-quality, electric fireplace will heat a room more efficiently than a real wood burning fireplace. Wood (or coal or gas) burning fires will vent up through a chimney and a good deal of heat is lost through it. Without the chimney, the electric fireplace uses all the heat produced to actually heat the room. With electric fireplaces, or at least those that aren’t purely ornamental and actually do provide heat, you’ll mostly treat as you would any space heater. You’ll want to keep it away from anything particularly flammable, of course; don’t pile your laundry up against it, for example. Any kind of ventilation required will typically be handled by the design of the fireplace. That is, they’ll have built-in a way of ventilating the heat that will be effective in its design without you having to do anything extra. You won’t need to install or use a chimney or any ventilation pipes. You can even place some electric fireplaces in your old fireplace or directly on your drywall. Just follow the directions that the manufacturer details. We looked at 35 other electric fireplaces. Even though they didn’t make our 5 best electric fireplaces list, they’re the best of the rest and each is still a great option for your home. The information you’ll need to compare each one is included with the listing. Available in a selection of three different colors, this electric stove heater fireplace features a vintage-looking design that looks sharp in any setting. The fireplace can be operated with or without heat so you can enjoy the look of a fire year-round. This freestanding electric stove features a traditional-looking design that is both elegant and portable, making it the perfect finishing piece for nearly any room. 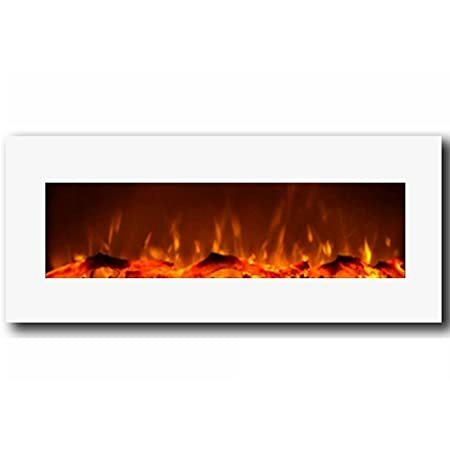 It offers a three-sided view of realistic-looking log and flames. This plug and go heating electric fireplace is surprisingly convincing and even more pleasantly warming. 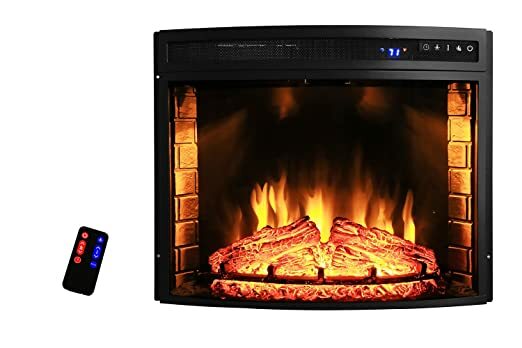 There’s no wonder this is Amazon’s #1 Best seller for Electric fireplace stoves, it has over 700 customer reviews and an overall rating of 4.4 stars. 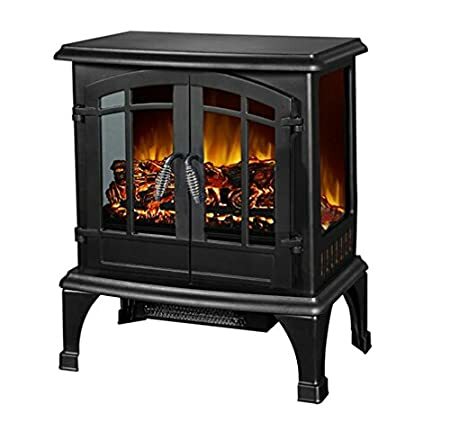 This is Amazon’s choice for electric wood stoves and it does a remarkable job convincing the flame and fire are real. This electric fireplace features a portable design and realistic wood stove look to provide you with years of beautiful home heating comfort. It can be run with or without heat so you can enjoy the look of a fire year-round. 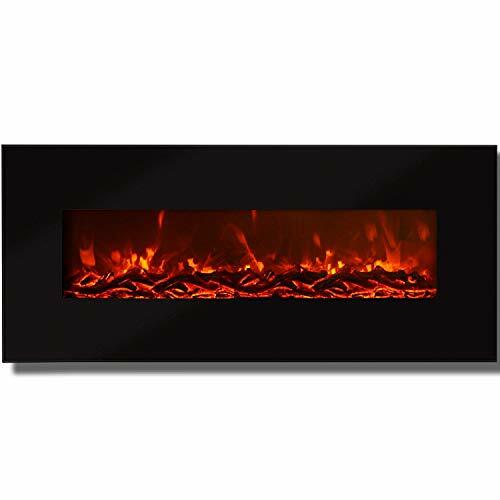 This wall-mounted electric fireplace features a slightly curved front glass that gives a sleek and modern appearance. It can easily be installed anywhere there’s an existing fireplace and requires just a standard electrical outlet to operate. This wall-mounted electric fireplace features a sleek design that can be flush-mounted for an elegant low-profile look. It’s available in a choice of two colors to suit your home’s design. 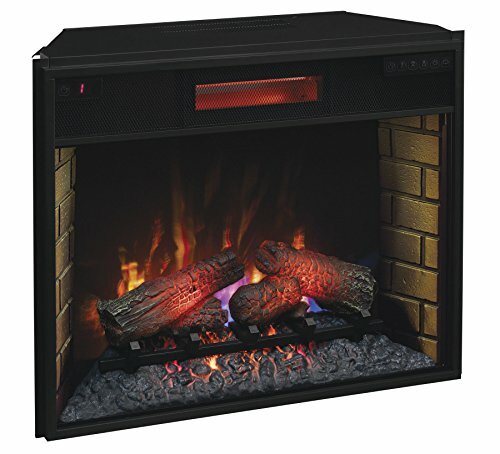 This electric fireplace can be wall-mounted or sit atop an optional base for easy portability. Natural stone inserts and patented 3D flame technology make for one of the most realistic-looking electric fireplaces on the market. This wall-mounted electric fireplace features a realistic-looking flame and operates at 100% efficiency to help save on your operating costs. The flame can be operated with or without heat, making it ideal for year-round use. This wall-mounted electric fireplace is both smokeless and ventless, making it ideal for installation in any room of your home. It is ideal for providing supplemental heating for spaces up to 400 sq ft in size and can even be run without heat for year-round use. This wall-hanging electric fireplace boasts flames with adjustable brightness that can even be operated without heat so you can enjoy the look of a fire year-round. Choose from two heat settings that can be controlled via the included remote. This wall-mounted electric fireplace is suitable for providing supplemental heat to rooms up to 400 sq ft in size and features energy-efficient LED technology that’s easy on your wallet. 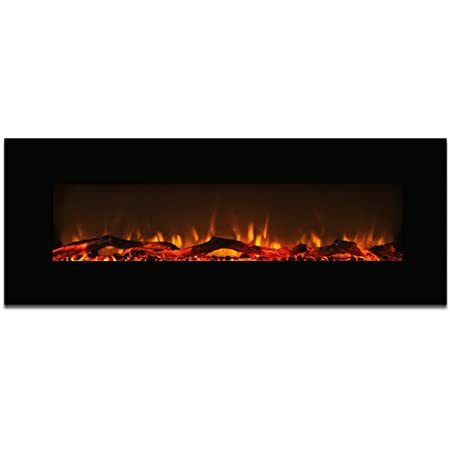 This ethanol fireplace heater insert offers an incredibly realistic-looking log and flame experience that can be used on high, low, or without heat for year-round enjoyment. Its smokeless and ventless design can be installed anywhere there’s a fireplace. This electric wall-mounted fireplace is both smokeless and ventless, making it ideal to install anywhere you’d like a little extra warmth. 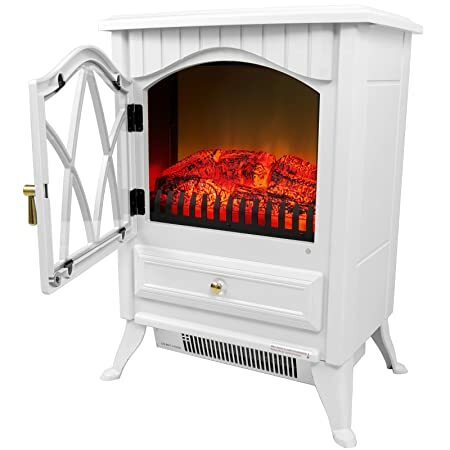 It features three flame settings and can be run without heat for year-round fire enjoyment. This wall-mounted electric fireplace features a smokeless, ventless design that can be quickly and easily installed in any room of your home. Choose from two heat settings or flame-only for comfortable year-round enjoyment. 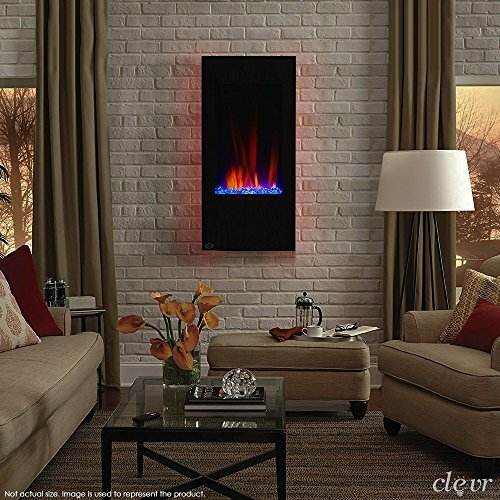 This wall-mounted electric fireplace is smokeless and ventless for easy mounting anywhere in your home. Its white color offers a sleek and modern look that can provide supplemental heat for rooms up to 400 sq ft in size. This electric wall-mounted fireplace features a vertical design that gives it a very modern appeal, and allows it to be installed in more spaces. Can be mounted on the wall or recessed for a clean, low-profile look. This wall-mounted electric fireplace boasts incredibly realistic 3D flame technology and is suitable for providing supplemental heating for rooms up to 400 sq ft in size. It can also be stand-mounted if you choose, making it easily portable. This electric fireplace has been specifically designed to be recessed-mounted so as to provide a flush look and finish. It features a highly realistic-looking flame that is perfect in living rooms, bedrooms and even boardrooms. This fireplace built into a TV stand will hold a TV up to 60″ wide. This elegant fireplace features a unique design that makes is perfect for setting up in any corner of your home while providing supplemental heat. It plugs into any standard electrical outlet, making it a breeze to install. 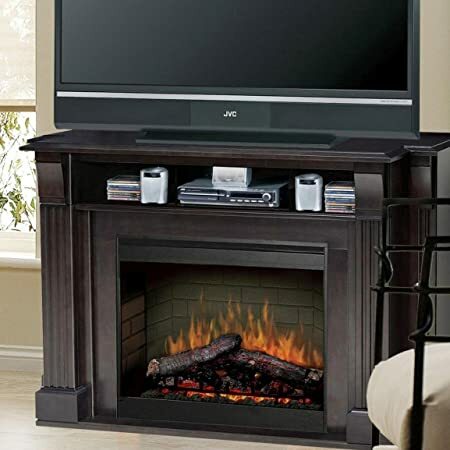 This television stand features an integrated electric fireplace in a compact design that’s ideal for small spaces. Suitable for use with flat screen TVs, it also features a shelf to store all your media center equipment. 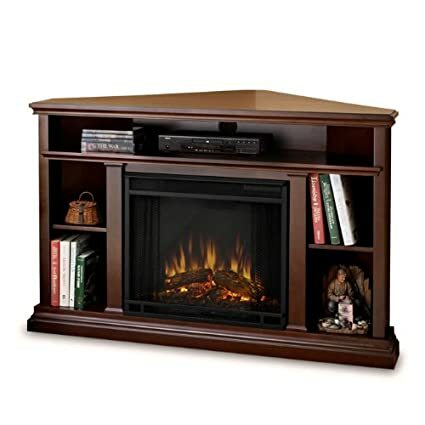 Available in a choice of two finishes to suit your design style, this electric fireplace and entertainment center combination features several shelves for all your storage needs and features a programmable thermostat to help keep your family comfortable. Thanks to the design of this electric fireplace, you can install it quickly and easily in the corner of any room. There’s no special venting required, and it uses your home’s standard electrical outlet. This electric fireplace will be easily controlled with its remote from the comfort of your bed, couch, chair – wherever you are. This electric fireplace offers offers a complete entertainment solution thanks to integrated shelving. It’s made from solid wood and veneer to create a long-lasting piece you’ll be proud to display in your home. This electric fireplace features a traditional design that is available in a choice of two colors, making it ideal for any home. 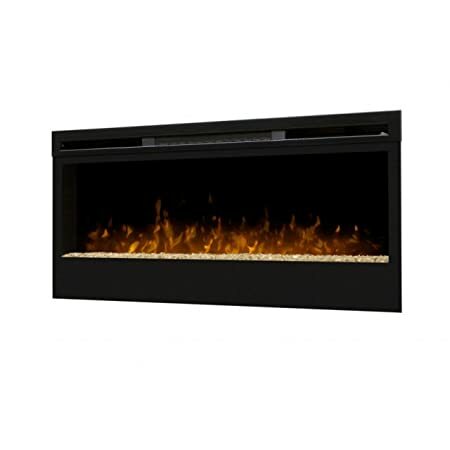 It boasts realistic-looking LED flames and faux wood logs for a beautiful finish. This electric fireplace features classic styling and a traditional design that makes it the stand-out piece in any room. It is available in a choice of finishes to suit your home’s decor. 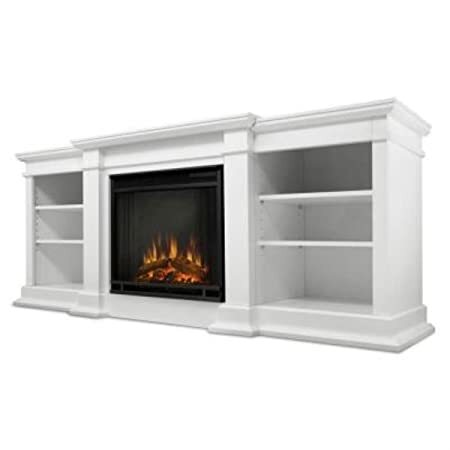 This gorgeous electric fireplace gives the appearance of a built in bookcase mantle and hearth that is absolutely stunning in design and function. 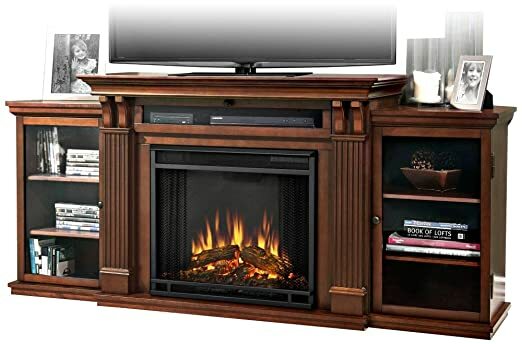 This unit offers an electric fireplace and media center in one package and even features a space for rear cord management. It boasts a durable MDF wood construction with old oak veneer for increased durability. 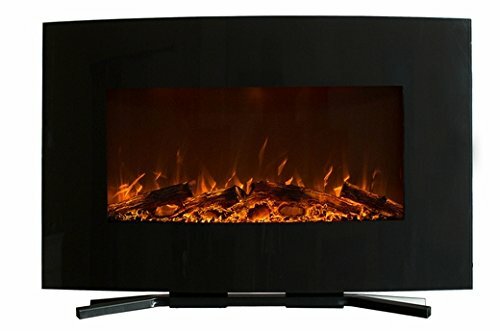 This electric fireplace offers a sleek and modern curved design that can easily be installed where any fireplace currently is. It features a realistic-looking flame and is covered by a 1 year limited warranty. 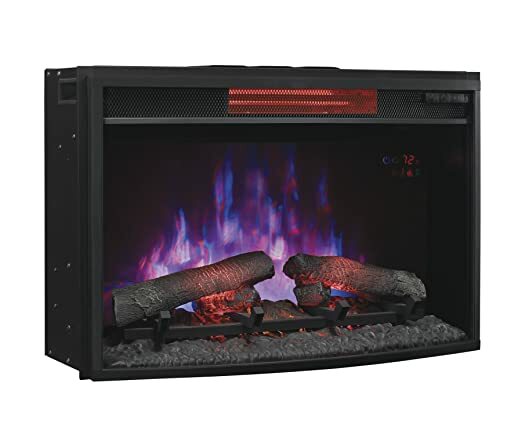 This fireplace insert features multiple flame color, speed and brightness levels that can be run with or without heat for comfortable year-round enjoyment. It is suitable for heating spaces up to 1000 sq ft in size. This electric fireplace insert requires only a basic household electrical outlet to get up and running, making installation quick and easy. Choose from multiple flame colors and settings for the ultimate realistic fire experience. This electric space heater features a unique design that allows it to be installed recessed for a clean and low-profile look. Choose from high, low or no-heat settings that allow you to enjoy your electric fireplace year-round.